I've been so darned busy this past week and I see no end in sight. Well, I do, but not until we get much closer to winter. I'm not complaining. I actually enjoy being busy, and it makes downtime that much sweeter and luxuriant. Among the many things I've made over the past few days, I resurrected the image of an old favored Artist Trading Card by having lovely giclee reproductions made on nice watercolor paper. 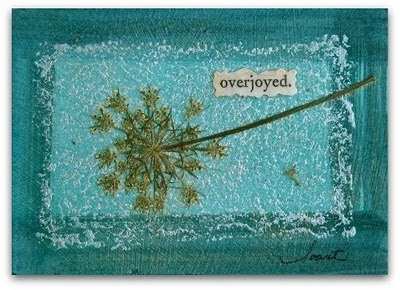 Needless to say it's called "overjoyed" and I'll be overjoyed when I make some of that downtime! You can find these prints and other handmade goodies at my ArtFire Studio and at my Zibbet Studio. Peace. Love this. Sometimes it is good to remember to 'Be' this. I never would have guessed this was a print, lol! Beautiful. Your work is lovely. What a talent you have been given. This is gorgeous - my favorite color! I hope you get some down time soon! Enjoy your cauliflower! And Reeni - that roasted cauliflower smells divine! I love your blog and am so grateful for your kitchen creativity! My 1st BlogBlast for Peace Sighting of 2010!